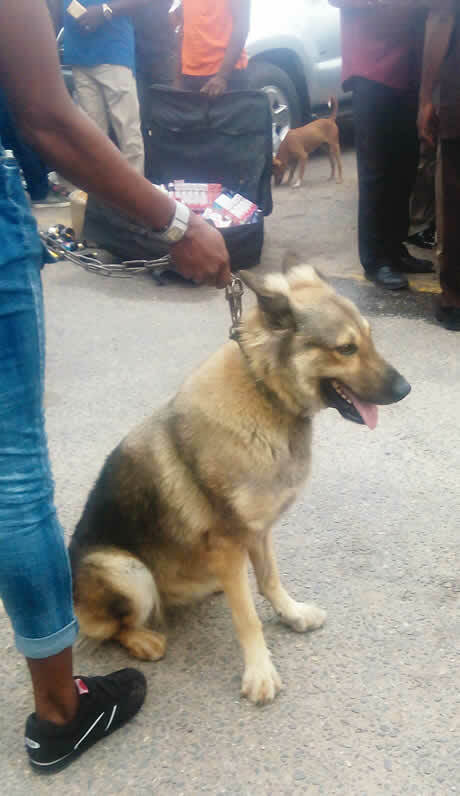 Operatives of the Special Anti-Robbery Squad, Lagos State Police Command, have arrested an Alsatian dog named Bullet, for alleged robbery in the Ladipo, Oshodi area of the state. 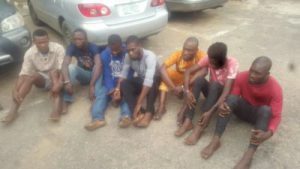 The state Commissioner of Police, Edgal Imohimi, during a parade of the dog at the command headquarters in Ikeja on Thursday, said two other robbery suspects, Odunade Olajide and Adeniyi Adisa, sent the dog after their victims. He explained that in fear, their targets would surrender their belongings. The CP said after dispossessing the victims of cash and other valuables, the suspects would speed away with the dog on a motorcycle. He said the men, however, met their Waterloo while attempting to rob a lady of her valuables in Ladipo, as the victim raised the alarm and the suspects were apprehended by the police. Imohimi noted that their operational motorcycle was also recovered. The CP explained that detectives had been on the trail of the suspects, but luck ran out on them last Thursday when they were arrested. But the suspects denied the allegations, saying they had only gone to buy dog feed when the woman raised a false alarm. Olajide said the woman eventually found her phone where she kept it, adding that by then it was late as SARS operatives had arrested them. Also paraded were five suspected killers of a former winner of the Gulder Ultimate Search, Hector Jobarteh. 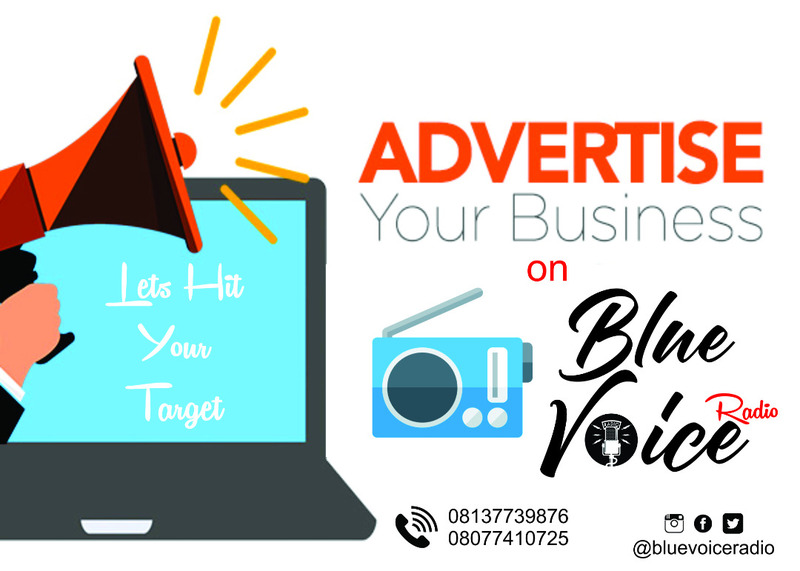 The suspects – William Igana, Valentine Igana, Abdul-Rasheed Jimoh, Francis Madu, Usman Adeyemi – were alleged to have been involved in the death of the 38-year-old at his house on Olufowora Close, New Oko-Oba, Agege. PUNCH Metro had reported that Jobarteh was shot dead on September 3, 2017, after he was trailed to his home from the airport where he had gone to pick up his younger brother. However, one of the suspects, William, a Uber driver that drove the suspects to Jobarteh’s house, said he didn’t know their mission when he was hired. He noted that he had just started with the online transport company when he was hired by the men who later turned out to be killers. He said after the trip to Yaba, JK called him the following day and asked him to take him and his friends to Abeokuta, Ogun State. Jobarteh’s phone was said to have been stolen by the assailants. PUNCH Metro learnt that the phone was tracked to Jimoh, who bought it at Computer Village, Ikeja. He said he had innocently gone to Computer Village to buy a phone, adding that he bought the phone for N15,000 from Madu. On his part, Madu claimed an engineer friend who came with Adeyemi, sold the phone to him. He said he bought the phone for N7,500 and sold it for N15,000. Imohimi said the command was making efforts to arrest other suspects, adding that the men would be charged to court at the end of investigations.